There is nothing so ugly, so anti-family values as conservatives and their bigotry, their desire to harass and abuse people they see as ‘other’ in us vs them thinking. The hypocrisy of claiming family values while hating on other people’s children is stark. Nebraska teachers are instructed to ask students what their preferred pronouns are. “Always ask yourself . . . ‘Will this configuration create a gendered space?’” the document says. And this is making the rounds of right wingnut email as well; it wouldn’t surprise me to see it turning up in the content of the radical religious right in MN, or in the fund raising literature of our own John Kline. How does this relate to John Kline, representing Minnesotans in Congress and controlling the educational policy of the nation? The Dignity in Schools Campaign (DSC) challenges the systemic problem of pushout in our nation’s schools and advocates for the human right of every child to a quality education and to be treated with dignity. The DSC unites parents, youth, educators and advocates in a campaign to promote local and national alternatives to a culture of zero-tolerance, punishment and removal. When the ESEA is brought to the floor of the Senate in either December or January, there is a push to attach the Student Non-Discrimination Act, HR 4350 (SNDA), to it. SNDA includes comprehensive federal prohibitions against discrimination in public schools based on actual or perceived sexual orientation or gender identity. It would forbid schools with public funding to discriminate against LGBT students or ignore harassing behaviors. The bill was re-introduced, having not been added in committee in ESEA, by Sen. Al Franken (D-Minn.) and Rep. Jared Polis (D-Colo.). (watch the video, grab a tissue.) Co-sponsored by 34 senators, it needs the approval of 60 senators to attach it to the ESEA before going to the House for a vote before it becomes law. “Is it needed?” you may ask. Only 13 states have laws protecting LGBT students from harassment at school; this is not a surprising statistic when you also realize that 15 states do not even include sexual orientation and gender identity on the “hate crimes” list; in 29 states you can still be fired for being gay; and in 34 states you can be fired for being trans. Now is the time to voice to your senators and representative that it is their duty as public servants to serve the most vulnerable of their constituents: LGBT children. Tell them to get on record now in support of the Senate bill and the version that comes to the House. Any senator or representative that votes against the protection of vulnerable children should not hold that position of trust. I am a Mom too, with two straight, adult children. I am a straight, Evangelical Christian compelled by my faith to stand for justice and against oppression. The argument of some conservative family groups and lobbies against this bill is the fear that this bill will “victimize people of faith by turning religiously-based, anti-gay comments into ‘thought crimes’ ” (Rep. John Kline R-Minn.). This is fear-based rhetoric. Anti-discrimination laws punish actions, not opinions or beliefs. Kline, Bachmann, Paulsen, and Emmer if he can succeed Bachmann — every one of these radical rightwingers adamantly oppose any action which would interfere with THEIR religious bullying, in the name of religious freedom. Religious freedom is not a free pass to terrorize and harrass and demean other people, including children. But that is exactly what the right wants, and exactly why they should all be removed from any role in government. But that is MOST true of Kline, chairing the House Committee on Education and the Workforce. Kline wants to permit kids to be bullied, he wants them less safe, he wants to prevent government from protecting them — and if that also means that they get a poorer education, he doesn’t care. Those kids, those families – they don’t matter to John Kline. John Kline “won” the FlipADistrict contest, not because the Second District DFLers advanced his name but instead because of his “performance” as Chairman of the Education and the Workforce Committee. Two main issues were cited — student debt and school safety. A lot has been written on the Roundtable about how Chairman Kline “reformed” the student loan program to make it a money-maker for the US Treasury, but not enough has been written about keeping students safe. Everyday there are tweets encouraging Chairman Kline to allow a hearing and vote on H.R. 5005: Ending Corporal Punishment in Schools Act of 2014 and some want a vote on H.R.1893 – Keeping All Students Safe Act. Students have died and Congress is unable to act because of one man — John Kline. “One of the insidious results that will come from this bill is to take away from the States the right they have to regulate education. That is given to them by the Constitution. Since the U.S. Constitution was first ratified, the Federal Government has slowly, steadily and corrosively eroded the notion of States’ rights and of our individual liberties. Nowhere in the Constitution does it empower the Federal Government to override States’ rights. Voters have a choice this November … elect Mike Obermueller or vote for a “State’s Rights” guy who is willing to shutdown the government to get his way. 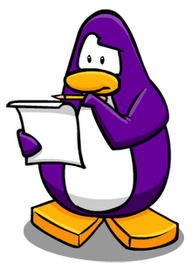 Purple penguin? Is that true? How silly. Can’t we adults do better? Maybe that is the mascot, then it would be appropriate. Yes,this relates to Kline. He hurts instead of helping.